The Maui News / MATTHEW THAYER photo Cory Williams shows Kula’s Louise Brandeburg, 84, how to block a punch Tuesday. 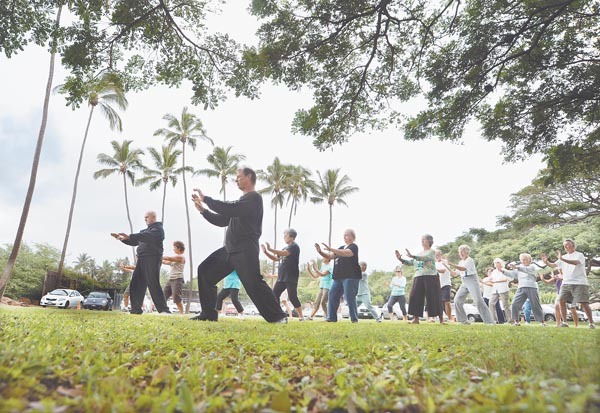 Seeking strength and balance in the shade of a Spreckelsville monkeypod tree, a taiji class goes through its moves at Kaunoa Senior Center on Tuesday afternoon under the direction of Cory Williams. Williams teaches a half dozen classes weekly for Kaunoa, including locations in Lahaina, Kahului, Kihei and Spreckelsville. 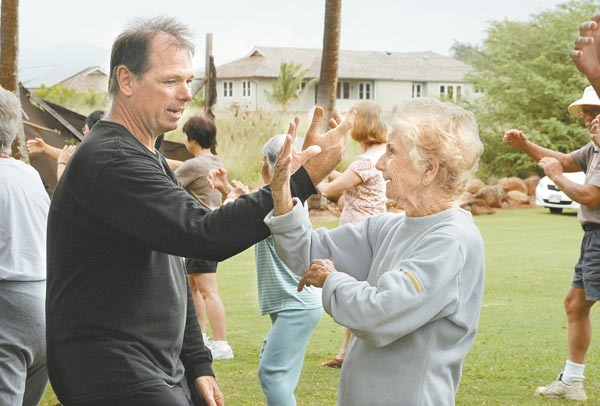 By mixing the “energy cultivation” exercises of “qigong” and the martial-art maneuvers of taiji, Williams said, he helps Maui seniors stay active and on their feet. Williams said taiji is now the accepted spelling of tai chi. Good for you, Cory!!! These are great pictures and wonderful publicity! Looks like you have a huge class. Thanks Zoe the class had 22 people in it. As of now it is a regular ongoing class like all my others with Kaunoa. This is great news! Wonderful to see how you’re spreading this great practice.